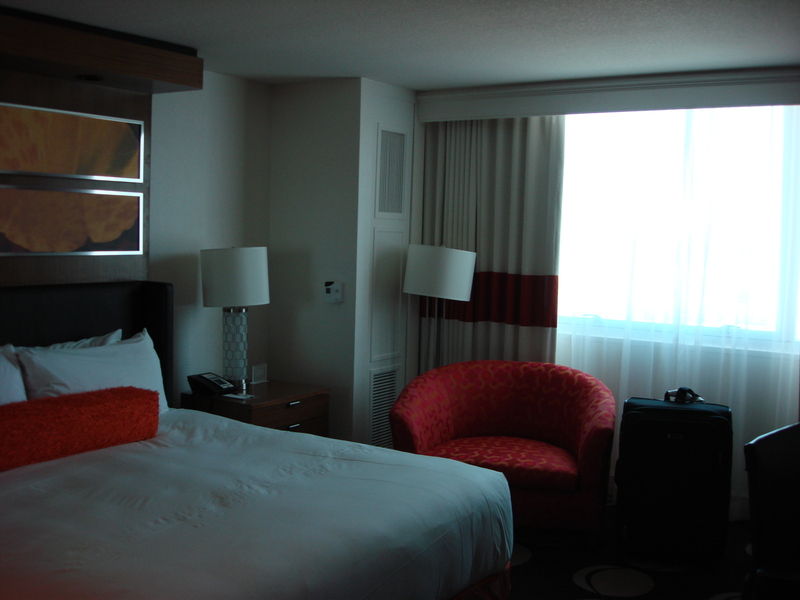 We stayed in a wheelchair accessible room at The Mirage for the first time in 2009. We actually booked a cheap package on-line and then called the resort to request that a wheelchair accessible room be set aside for us. This usually works okay in Vegas because they have a lot of wheelchair accessible rooms (so don’t be afraid to scope out cheap Vegas deals on-line). 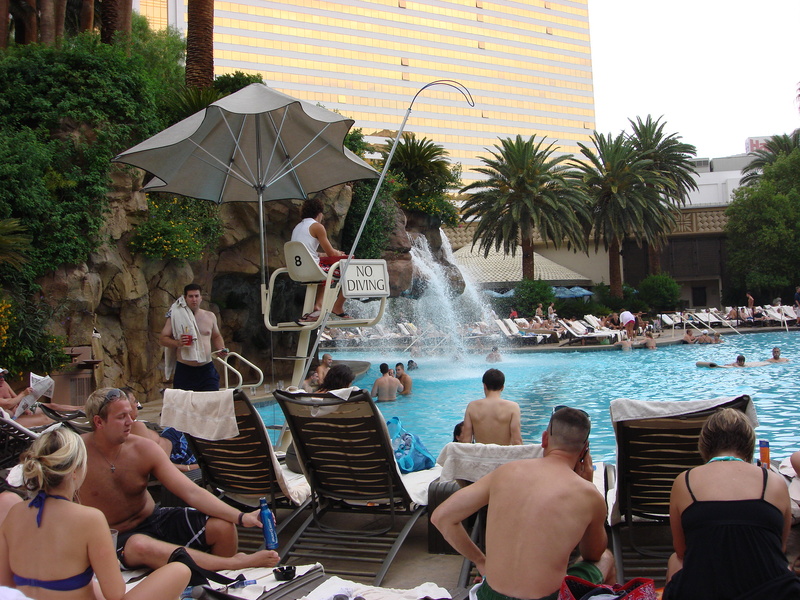 The Mirage is one of our favourite hotels because of its central location on the strip and its pleasant atmosphere. I really like all of the greenery and the sound of the water inside The Mirage as it feels kind of tropical. The Mirage is completely wheelchair accessible. Wheelchair users will have no trouble getting into or accessing any of the shops or restaurants here. We particularly like the layout of The Mirage because you don’t have to walk a mile from the lobby area to get to the hotel rooms. 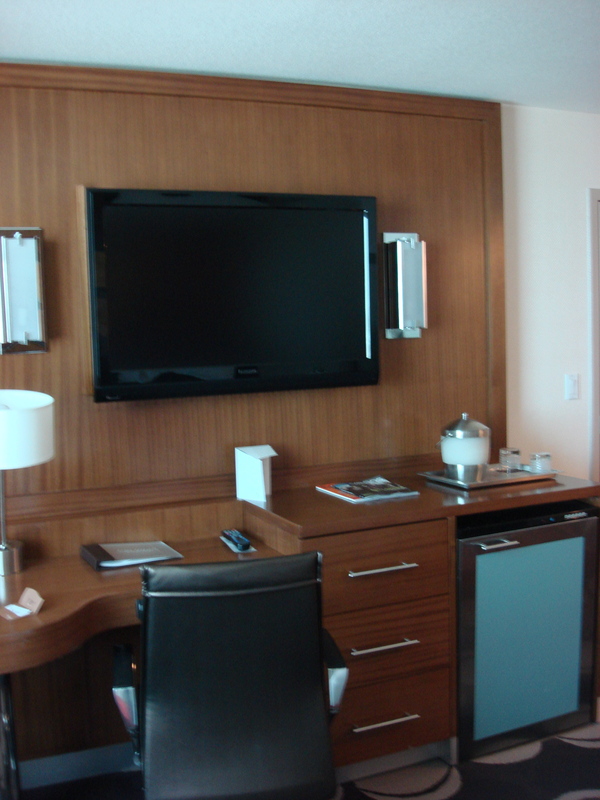 In our standard room, there was a comfortable, king-sized bed, a desk, a TV, two chairs and a mini-bar. The bathroom was spacious, but not huge. 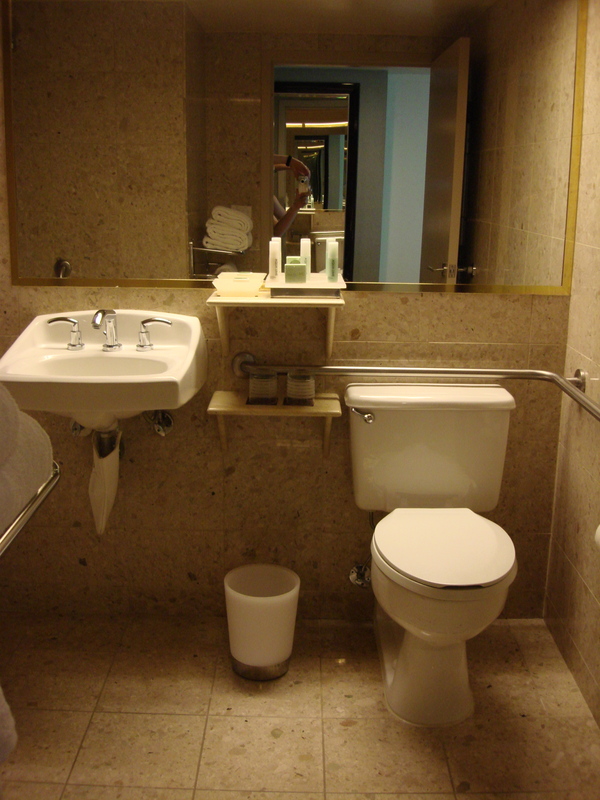 Our room had a wheel-under sink, toilet with grab-bars and a bathtub with a portable shower bench. Most of the accessible rooms at The Mirage have bathtubs, not wheel-in showers. I understand that they do have a few rooms with wheel-in showers, so if you absolutely require one you should probably book with The Mirage directly to ensure you get what you need. The pool area at The Mirage is quite big although it is really busy and it was difficult, at times, to find a free lounge chair. 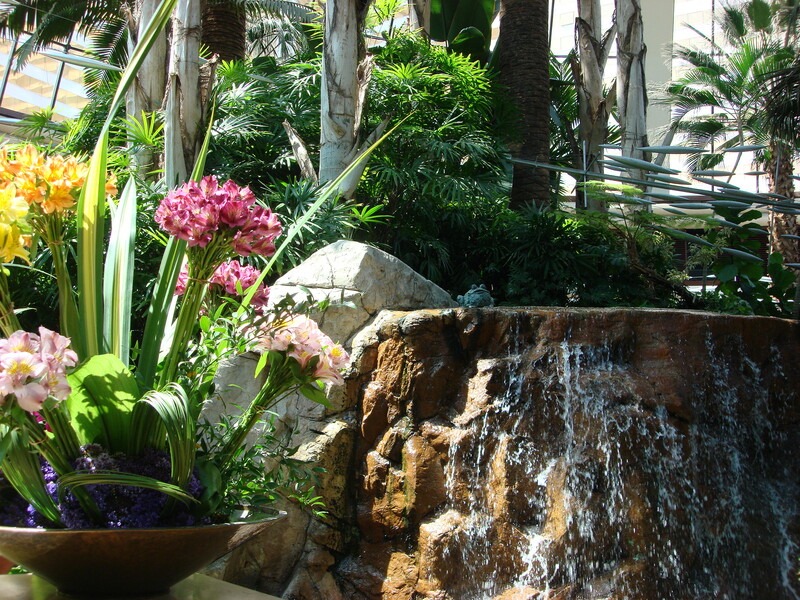 There are lots of waterfalls and palm trees, which help to create a nice outdoor ambiance. We didn’t see any pool lifts at this pool and it was so busy that we didn’t try to get into the water. It was a good place to kick back for a few hours and do some people watching. 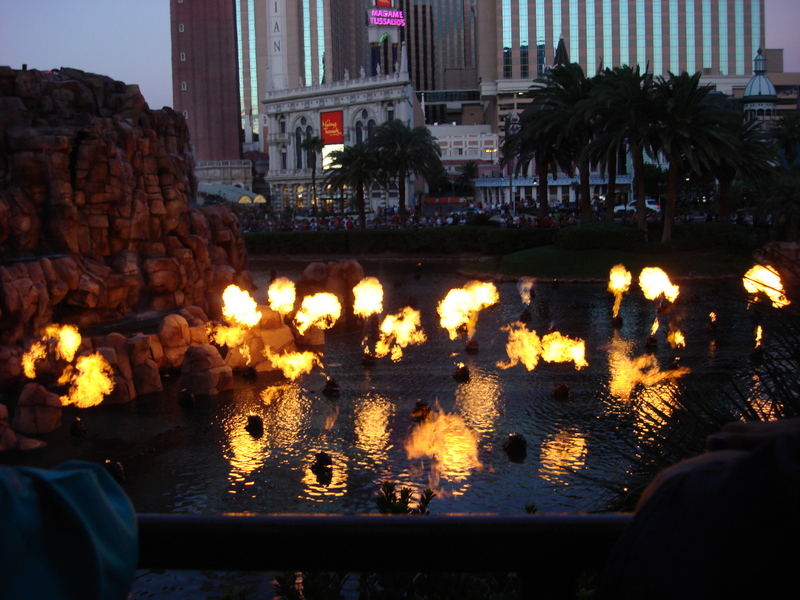 The Mirage has upgraded its volcano show in recent years and it is actually pretty cool to watch now. 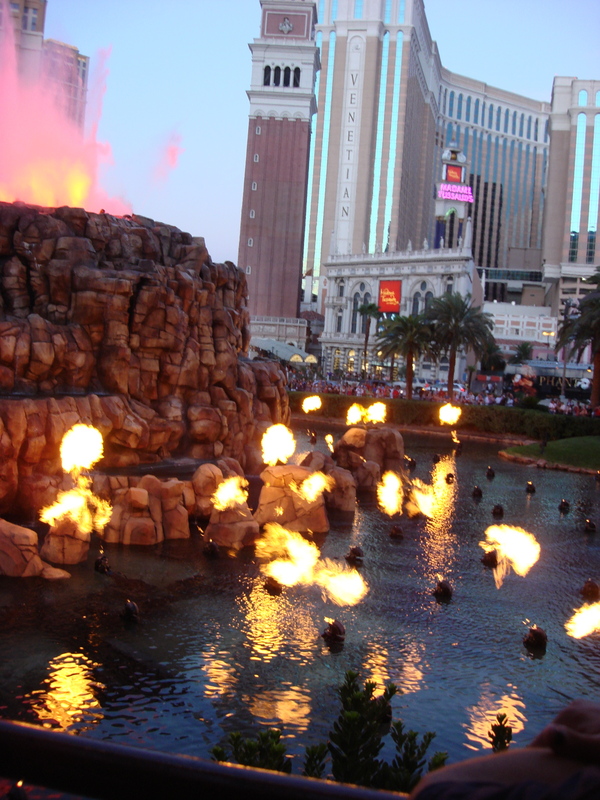 There is loud drum music that accompanies the flames that shoot out of the water. It goes off every half an hour in the evening and is worth catching at least once when you are in Vegas. There is lots of good food available at The Mirage. The California Pizza Kitchen (one of our favourites) is located just off to the side of the casino. We also tried a place called BLT Burger that serves all kinds of milkshakes. They will also combine a variety of weird milkshake flavours if you ask, so you can really go wild (Twinkies, Nutella and toasted marshmallows milkshake, anyone?). The view from our room was bad. Not only did we not get a strip view but we got the concrete jungle view on the opposite side. It’s not as though you spend a lot of time staring out your window in Vegas, but still. This is almost as bad as it gets. One issue that we have encountered a few times now is that some of the elevators outside on the strip can be out of order. 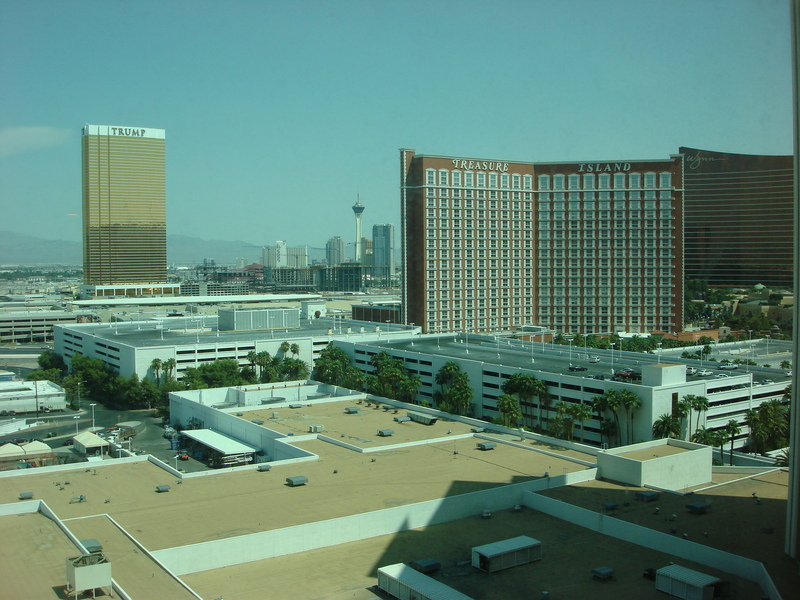 There are several pedestrian walkways that cross over top of the strip or that connect one hotel to the next. To get to the top of the walkways, you either need to head up the escalator (if there is one) in your chair or access the elevators. Nothing in Vegas is that close so when you get to the other side of the walkway and realize you can’t get down in your wheelchair because the elevator is out of order, it is a big pain. We have even been in a situation once where we took an escalator up to get to a walkway and when we got to the other side, the elevator was out of service. So we walked back to where we had come up and there was no down escalator and no elevator, only stairs. So… we were stuck… We had to convince several guys to carry my husband down a huge flight of stairs. This is something to watch out for as the elevators are out of service from time to time and it is possible to get up without being able to get down. The only thing I really do not enjoy about Vegas and the Vegas hotels is that smoking is allowed in the casinos. California Pizza Kitchen is one of our favourite restaurants in Vegas, but it is located on the edge of the casino in The Mirage. When you are dining at CPK, it is impossible to escape the smell of the smoke and, for me, it certainly detracts from the ambiance. The Mirage is a great, family-friendly resort. 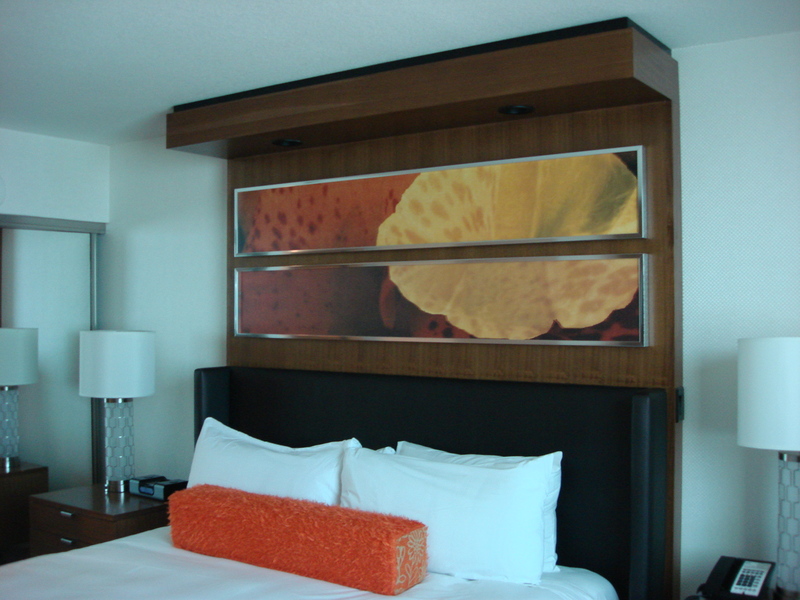 It is situated in a convenient central location on the strip, between Caesar’s Palace and Treasure Island. There is lots of good food on-site and it is right next door to The Forum Shops at Caesar’s (some of the best shopping on the strip). 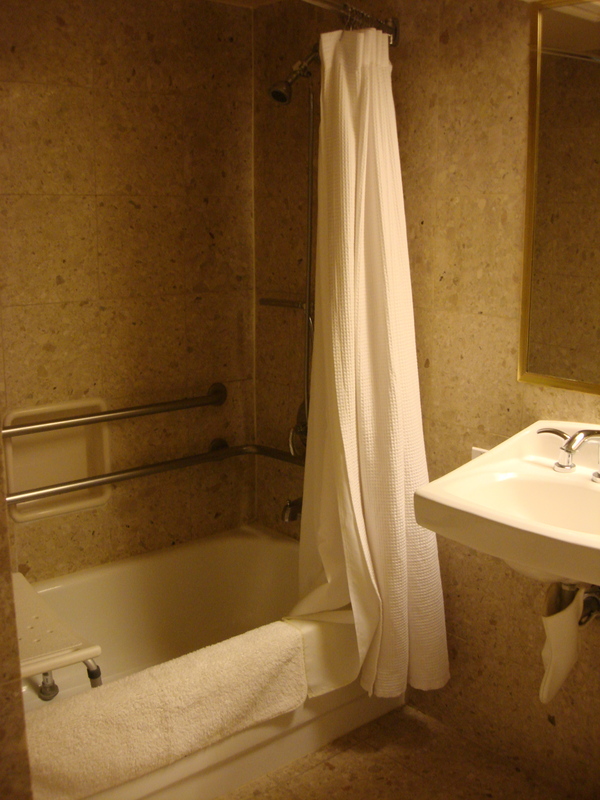 The standard wheelchair accessible rooms are nothing fancy, but they are comfortable and they meet basic accessibility requirements. Who spends time in their room in Vegas anyway? 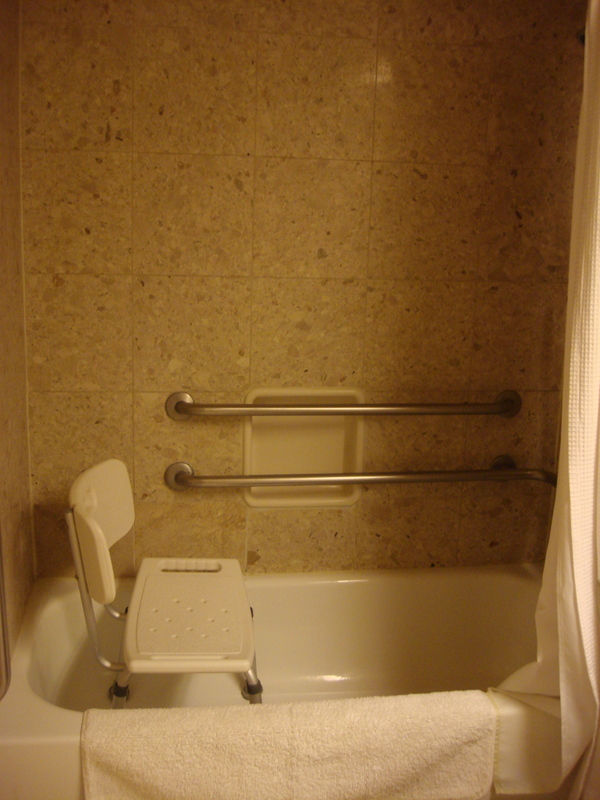 This entry was posted in Las Vegas, Nevada, United States and tagged accessible, bathtub, BLT Burger, CPK, disability, grab bars, holiday, king-sized, las vegas, manual wheelchair, mirage, pool, room, shower bench, spinal cord injury, The Mirage, trip, vacation, volcano, wheel-under sink, wheelchair by papawheelieblog. Bookmark the permalink.